Vitamin D has became widely recognised as crucial to our health after it turned out many people were deficient due to the wide spread use of sunblocks and/or avoidance of the sun. Now the next supplement getting lots of attention is magnesium. I discovered it a few years ago when it was suggested to me that it would help relax me if taken before bed. Ever since then I take it in powder form (for better absorption) mixed with water every single night. Here Shabir Daya (pharmacist at Victoria Health) explains it’s properties and importance in full. Turns out that magnesium deficiency resembles symptoms found in old age! Magnesium is the fourth most abundant mineral in the body and can be found in the teeth, bones and red blood cells. In fact half is found in bone and the rest in soft tissue in the body. The body jealously maintains about 1% of its magnesium within the blood making blood tests notoriously difficult to identify a deficiency. It activates more enzymes systems in the body than iron and zinc combined. It is estimated that a staggering 70% of the adult population may be magnesium deficient. People at serious risk of magnesium deficiency include the elderly, diabetics, those on low calorie diets, those over-indulging in alcohol and those engaged in heavy exercise. Given the facts on magnesium deficiency, why are our diets simply not capable of providing us with this vital mineral? In the early 1900’s, our foods and water supplied us with sufficient magnesium. Unfortunately, nowadays our drinking water is filtered stripping vital minerals including magnesium, and modern farming methods have depleted the soils. In fact, magnesium levels in our water and foods are half what they were hundred years ago. Foods rich in magnesium include pumpkin seeds and spinach but one would have to eat a lot to even remotely try and counter deficiencies and frankly only supplementation will help to address this deficiency. Magnesium is a key mineral in the enzyme processes that convert food into energy. Several studies indicate that individuals with low magnesium levels use more energy and therefore tire quickly. Magnesium is critical for both the synthesis and secretion of insulin which helps to break down glucose into energy at a cellular level. More often than not, diabetics are deficient in magnesium and there is justification in the use of magnesium supplements in diabetes not only to improve glucose tolerance but also to reduce the risk of many diabetic complications. Research indicates that magnesium deficiency may lead to chronic fatigue syndrome as cellular functions slow down. Premenstrual Syndrome is a name given to varied physical and emotive symptoms such as abdominal bloating, breast tenderness, headaches, fatigue, irritability and anxiety that occur two to seven days before the onset of menstruation. 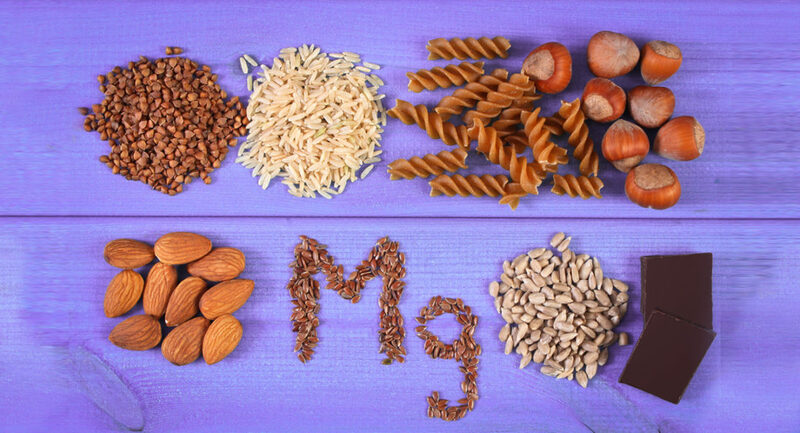 Sufferers of PMS have significantly lower levels of magnesium suggesting a clear association. In fact research by Dr David Thomas showed sufferers of severe PMS will tend to have common elements within their diet. They will consume only half the average intake of iron and zinc. They will consume only a quarter of their necessary magnesium and will consume almost 80% more dairy and a staggering 275% more sugar! The inability to sleep may also be linked to magnesium deficiency. If you find it difficult to sleep or find yourself waking up in the middle of the night with muscle spasms, cramps or stiffness, you may benefit from magnesium supplements. Several studies indicated that magnesium supplements were found to benefit sleep quality by decreasing the release of cortisol, the stress hormone that is responsible for sleep deprivation. Although calcium is the most abundant skeletal mineral and the best known nutrient for maintaining bone density, new research has indicated that magnesium supplements may be of great value in both the treatment and prevention of osteoporosis. The fact is that calcium is very poorly soluble on its own. It requires primarily sufficient quantities of magnesium and vitamin D in order for it to be absorbed into the bone. Magnesium deficiency alters calcium metabolism and affects the hormone that regulates calcium balance in the body. Research indicates that osteoporotic women have less bone magnesium and that magnesium intake is a significant statistical predictor of bone mineral content. Like calcium, magnesium is essential for the proper function of muscles. Calcium is responsible for the contraction phase of muscles whilst magnesium is needed for the relaxation phase. Painful cramping at night and irritating twitches in the eyelids are usually the first signs of magnesium deficiency. Restless Leg Syndrome, a poorly understood neurological disorder, responds favourably to magnesium supplementation. Many studies indicate that there is a relationship between headaches, migraines and low levels of magnesium in the bloodstream. Magnesium’s benefits appear to be related to its muscle and nerve relaxing properties. In cluster headaches, people suffer from up to 20 bouts of pain daily in a single siege that can last for months. Magnesium infusions may end those cluster headaches with some relief often within a seven day period. Magnesium works with calcium for the optimal function of the nervous system. Without adequate magnesium, the nerve cells cannot give or receive nerve impulses resulting in sensitivity to all types of stimuli such as lights may appear too bright, noises too loud and emotional reactions exaggerated. A deficiency in magnesium can result in the symptoms of anxiety and irritability since magnesium is required for the manufacture of adrenal stress hormones. Kidney stones, one of the most painful urinary disorders, have beset humans for centuries. A kidney stone is a hard mass of chemicals from urine. The most common type of kidney stone contains calcium oxalate. Studies indicate that magnesium helps prevent recurrence of calcium oxalate kidney stones due to its effects on solubilising calcium in urine. By now you will have realised the crucial role of magnesium in the body’s processes, understood how deficiencies arise and that dietary intake from foods is simply not achievable. This leads us to simply accept that we do need to supplement magnesium. Unfortunately, magnesium supplements, either in a multivitamin or otherwise, are ill-absorbed by the body with average absorption rates of only 20%. Our intestines are simply not efficient at absorbing magnesium from supplements and increasing the intake simply results in diarrhoea. Absorption is dramatically reduced with poor digestive efficiency, particularly as we age or when unwell. This is why hospitals will always favour a slow, gradual supply (IV drip) rather than an oral intake. So how can we achieve optimal levels of magnesium in the body if supplements simply do not provide enough of this vital mineral? Having researched all the different types of magnesium supplements on the market, I endorse Pure Magnesium Oil which is a supersaturated solution of magnesium chloride derived from ancient Zechstein seabed mineral salts. Magnesium chloride is the form favoured by our bodies. In fact whatever the compound we take, it is converted to the chloride form in the stomach for better absorption and retention. Magnesium Oil is not actually an oil but when applied to the skin it simply feels like an oil that is quickly absorbed through the skin to deliver magnesium to the body without any of the side effects associated with the oral route of taking magnesium liquids or tablets. Several studies have shown that using Magnesium Oil raised magnesium levels to the top of the reference scale within eight weeks (and without side effects) whilst the oral route can take two years or even longer! Magnesium Oil is also available as bath soaks or flakes and this method also deliver therapeutic quantities of magnesium into the bloodstream. Magnesium Oil applied directly to the skin quickly floods and bathes cells and over the course of a day Magnesium Oil offers a gradual and optimally absorbable supply of magnesium. This particular Zechstein Inside source has been protected, filtered and condensed one mile underground for 250 million years! Unlike open-water sources it has absorbed no man-made pollutants from the atmosphere and is the purest natural form or magnesium chloride known. For this reason Magnesium Oil and Flakes are supplied to a number of medical institutions including the University College London hospitals. Small regular applications provide an excellent way for outpatients or parents to self-administer. Magnesium Oil is suitable for use in children and during pregnancy as it does not require primary processing by the stomach or organs so no diarrhoea effects. The positive effect on muscle cramping tends to be noticed very quickly indeed but you will also see an improvement in the health of your skin. Magnesium is necessary for the elasticity and dermal protection of the skin and you will notice a smoothing and softening. In fact those suffering from psoriasis and eczema will experience a reduced irritation, redness and repair. Magnesium Flakes provides an excellent way to gradually and gently increases magnesium levels while providing wonderful muscle relaxation. Simply apply to a body bath or a foot bath and relax for 20 minutes. Because Magnesium Oil is not processed by the digestive system or organs there are no reported contra-indications. However we would always advise patients with severe cardiovascular disease, kidney disease and those taking warfarin or tetracycline should not take magnesium supplements unless on the advice of a physician. Thank you so much for sharing this info, as a labour and delivery nurse I often administer to my patients to prevent them from seizing when they are diagnosed with preeclampsia. And as stated above there are so many other beneficial properties to magnesium. Patients don’t always listen to us nurses but listen to celebs so thank you, maybe my future patients are reading your article and will take note. Thanks Glynis for the information. I will get with it and incorporate Mg oil in by personal hygene and suplement standard asap. I am always looking for new information and inspired knowledge about taking care of my health. Enjoy your site my friend. Take care! !